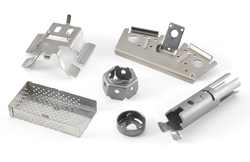 Since 1965 PM&T has been building high quality stamping dies to produce a wide variety of products of all shapes and sizes to meet our customers needs. We can design and build a custom die to run in your presses, or supply finished stamped parts to your exact specifications. PM&T designs, builds and repairs tooling for many other metal stampers, as well as for our Stamping Department. Capabilities include all types of dies including complex and high precision. Working to exacting specifications and close tolerances of many industries including automotive, appliance, aerospace, telecommunications, medical, electronic, electrical, and hardware. Send us your requirements today. We will respond quickly to your request. Plainville Machine and Tool Company, Inc.